Does it work? Apple cider vinegar (as a liquid) may reduce or slow the increase in blood sugar after eating (although it may not help diabetics) and may modestly aid with weight loss. The effects of apple cider vinegar may be due to its acetic acid content, which tends to be about 5% in vinegars (equaling about 800 to 900 mg of acetic acid per tablespoon). There is no good clinical research supporting the use of pills containing apple cider vinegar in powder form — these generally provide a much smaller amount of acetic acid per serving but can be dangerous if the acetic acid is too highly concentrated. (See What It Is and What It Does). Caution! Two pills were deemed Not Approved for mislabeling their acidity and/or having extremely high concentrations of acetic acid — amounts that would appear to classify them as "poison." (See What CL Found and use the Results table to compare the amounts of acetic acid in products). Best products: Three apple cider vinegars were chosen as Top Picks, providing real apple cider vinegar with appropriate acetic acid at a good value and without heavy metal contamination. CL also selected a Top Pick among pills. Other Concerns: Chronic use of apple cider vinegar may erode tooth enamel, so don't let it linger in the mouth and rinse afterward. As it may affect blood sugar levels, it should be used with caution in people with diabetes. It should be used with caution in people with gastroparesis, as it may slow the movement of food in the stomach. For more details, see Concerns and Cautions. Apple cider vinegar is produced by crushing apples and adding bacteria and yeast which causes fermentation. The sugars in the apples are first converted into ethanol, and the ethanol is further converted into acetic acid. All varieties of vinegar, including apple cider vinegar, contain acetic acid. Apple cider vinegar is normally diluted before being bottled to contain between 4% and 6% acetic acid (the FDA defines apple cider vinegar as containing no less than 4% acetic acid) as well as other acids (malic, lactic, and citric acid). This is considered mildly acidic (similar to balsamic vinegar, which is 4.5% acetic acid [Gullo, Int J Food Micro 2008]), as compared to some other types of vinegar that can be as much as 7% or 8% acetic acid. Apple cider vinegar may also be pasteurized to kill bacteria and create a more clear, uniform appearance. Apple cider vinegar sold as "raw" has probably not been pasteurized, and is often unfiltered. Organic apple cider vinegar is available in either pasteurized or unpasteurized varieties. Some laboratory and animal studies have found acetic acid (as found in all types of vinegars) to inhibit an enzyme (disaccharidase) that breaks down certain types of sugar into simple sugars, thereby helping to shuttle more sugar into muscle tissue. This effect could potentially help to keep down increases in blood sugar levels after consuming carbohydrates (Ogawa, J Nutr 2000; Fushimi, J Nutr 2001) and such an effect has been shown in clinical studies with apple cider vinegar (as discussed below) -- it also has been shown with white vinegar (6% acetic acid) in a study which found an increasing effect as the dose increased from about 1 tablespoon to 2 tablespoons (Ostman, EJCN 2005). In addition, there is some evidence that apple cider vinegar may increase the amount of time food remains in the stomach, which could also slow or lower increases in blood sugar after eating, as well as increase the sense of fullness, or satiety, after eating (Hlebowicz, BMC Gastroenterol 2007; Bjorck, Eur J Clin Nutr 1998). Apple cider vinegar as a liquid, but not as a pill, may reduce the rise in blood sugar that occurs after eating, although the evidence is mixed as to whether it is beneficial to people with type 2 diabetes. Several small studies have shown that in healthy people without diabetes, consuming apple cider vinegar with a meal can reduce the rise in blood sugar levels after eating (Johnston, MedGenMed 2006). For example, one study among eleven healthy adults found that consuming about a half a tablespoon of apple cider vinegar (added to 1 ½ ounces of water sweetened with 1 teaspoon of saccharine) during a high-glycemic meal (a bagel with butter and 7 ounces of orange juice) reduced the increase in blood sugar an hour after eating by 54% compared to when the same meal was consumed with the water and saccharine mixture but without apple cider vinegar (Johnston, J Am Diet Assoc 2005). A study of 12 healthy adults who consumed approximately 1 ¾ tablespoons of liquid apple cider vinegar (about 5% acetic acid, providing 1,250 mg of acetic acid) found that average blood sugar levels 30 minutes after a small meal (a buttered bagel and juice) were 12% lower than when the vinegar was not taken or when vinegar tablets (vinegar type not specified) were taken with the meal. The lack of efficacy of the tablets (4 tablets taken whole or crushed and dissolved in water) may be attributable to the lower amount of acetic acid they provided (700 mg total), although it might be dangerous to use tablets with higher concentrations of acetic acid, as discussed below. A separate two-month trial by the same researchers among 23 healthy adults found that insulin resistance decreased by 12% among those who took 2 tablespoons of red wine vinegar twice daily with meals (providing at total of 3,600 mg of acetic acid per day) while insulin resistance increased by 7% in those who took 2 vinegar tablets (providing a total of 45 mg of acetic acid) daily with meals. The researchers concluded that "... in healthy adults, commercial vinegar pills with acetic acid content ranging from 45 - 700 mg acetic acid per serving are not effective for improving glycemic control (Johnston, FASB J 2018). In a study among 11 adults with insulin resistance and 10 adults with type 2 diabetes, consuming about a half a tablespoon of apple cider vinegar (added to 1 ½ ounces of water sweetened with 1 teaspoon of saccharine) before a meal (containing 87 mg of carbohydrates) reduced the increase in blood sugar levels among those who were insulin resistant by 64% and improved insulin sensitivity by 34%, compared to placebo. In those with type 2 diabetes, there was a slight improvement in insulin sensitivity, but no significant improvement in blood sugar levels, compared to placebo (Johnston, Diabetes Care 2004). A study among eleven men and women with type 2 diabetes who consumed a snack at bedtime (1 oz. of cheese) with either two tablespoons of apple cider vinegar or two tablespoons of water found those who consumed the snack with apple cider vinegar had a greater average decrease (- 0.26 mmol/l) in fasting blood sugar in the morning compared to those who consumed the snack with water (-0.15 mmol/l) (White, Diabetes Care 2007). A larger study in Pakistan among 110 men and women with type 2 diabetes who were taking a common anti-diabetes drug (metformin + sitagliptin) and instructed on American Diabetes Association dietary guidelines found that those who consumed apple cider vinegar once daily for three months had statistically significant average decreases in fasting blood sugar (- 7.5%), HbA1C (- 7.2%), total cholesterol (- 6%) and triglyceride levels (- 6.2%), while those who consumed a placebo (water artificially flavored to taste like vinegar) did not. The daily dose taken was one tablespoon of organic apple cider (American Garden) containing 5% acetic acid added to approximately 7 oz. of water and consumed with dinner (Kausar, Int J Med Res Health Sci 2019). A study among 155 obese men and women in Japan suggests that drinking apple cider vinegar can modestly help with weight loss. In the study, the men and women drank an 8 ounce beverage containing either a low dose (½ tablespoon) or high dose (1 tablespoon) of apple cider vinegar, or a placebo beverage twice daily (after breakfast and dinner). After three months of daily use, those who drank the low-dose apple cider vinegar lost an average of 2.6 lbs., while those who drank the high-dose vinegar lost significantly more -- 4.2 lbs., and both of these groups' weight loss was significant compared to those who drank the placebo beverage (and did not lose any weight). Compared to placebo, those who drank either the low or high dose apple cider vinegar beverage also had modest decreases in visceral fat, waist circumference, and triglyceride levels, and those who drank the high-dose apple cider vinegar also had a slight decrease (about 4 mmHG) in systolic blood pressure. Interestingly, although fasting glucose, insulin sensitivity and HbA1C (average blood sugar levels over several months) were tested every four weeks throughout the study, there were no significant changes in any of these measures (Kondo, Biosci Biotechnol Biochem 2009). Another study, among 39 overweight/obese men and women in Iran, found that consuming 1 tablespoon of apple cider vinegar with lunch and dinner (a total of two tablespoons daily) for one month while on a calorie-restricted diet modestly decreased bodyweight and hip circumference compared to the same diet without apple cider vinegar. Among those who consumed apple cider vinegar, bodyweight and hip circumference decreased by an average of 8.8 lbs and 2.3 inches, respectively, while in those who consumed the same diet without apple cider vinegar, bodyweight and hip circumference decreased, respectively, by an of average of 5 lbs. and 1.3 inches. Those who consumed apple cider vinegar also reported a significant decrease in appetite compared to those who did not. Compared to diet alone, apple cider vinegar also significantly decreased triglyceride levels and increased "good" HDL cholesterol, but there were no significant changes in "bad" LDL or total cholesterol levels (Khezri, J Funct Foods 2018). Some products and websites promote the idea that drinking diluted apple cider vinegar before a meal can improve digestion or decrease gas or bloating after a meal; however there do not appear to be any studies demonstrating this effect. Consuming apple cider vinegar as an ingredient in a meal or taken with water after meal was not found to reduce heartburn among adults with self-reported heartburn and GERD-like symptoms. In that study 20 mL (about 1 ½ tablespoons) of apple cider vinegar (Bragg Organic Raw Apple Cider Vinegar, unfiltered and with "the mother" — tested in this review) was added to a meal of chili or diluted with 40 mL (about 7 ounces) of water consumed 15 minutes after the meal (Yeh, Arizona State University 2015). The researchers noted that in individuals who felt that the vinegar reduced their heartburn, the effect lasted for only about one hour, and then the heartburn intensity increased again. Some individuals reported that apple cider vinegar worsened their heartburn. The researchers proposed apple cider vinegar may irritate already-existing damage to the lining in the esophagus (which can occur due to chronic acid reflux). Apple cider vinegar is sometimes promoted to help "balance pH," or acidity, in the body. However, as ConsumerLab.com explained in an answer to a question about another product promoted to reduce acidity and balance pH, blood levels of acidity are closely regulated in the body and tend remain within a normal, narrow range. Although various foods may temporarily change the pH of urine, there is no evidence that this affects blood pH, or that such changes would be beneficial (Bonjour, Br J Nutr 2013). Due to its acetic acid content, apple cider vinegar has some anti-bacterial properties. Acetic acid, for example, has been shown inhibit the growth of bacteria such as Staphylococcus aureus and Pseudomonas aeruginosa. Apple cider vinegar is sometimes promoted as a "home remedy" for ear and skin infections, acne, nail fungus, and for wart removal. There are two reports of topical treatment with highly concentrated acetic acid (up to 99%) or acetic acid combined with other acids successfully removing warts -- one such regimen also involved use of local anesthesia, excision, and rapid neutralization at the site of application (to avoid chemical burn) (Johnston, MedGenMed 2006). There do not appear to be studies using regular, diluted apple cider vinegar to treat warts. Given the lack of evidence and the risk of chemical burn, as noted above, this use of apple cider vinegar is not recommended. There do not appear to be any studies in people on the effects of apple cider vinegar on acne or nail fungus. One small, preliminary study found that in people with chronic ear infection (otitis media) ear irrigation with 2% acetic acid solution three times per week for up to three 3 weeks, without antibiotic therapy, seemed to resolve the condition for a little more than half of the participants. However, the study was not blinded or placebo-controlled, making it impossible to draw conclusions (Aminifarshidmehr, Am J Otol 1996). In another small study, diluted vinegar (10 ml vinegar -- not specified as apple cider vinegar but containing 2.25% acetic acid -- mixed with 30 mL water) used to irrigate the ear one to two times daily resolved ear discharge due to ear inflammation (granular myringitis) significantly faster than antibiotic ear drops. Ear canal irritation and pain and dizziness associated with the use of vinegar were reported (Jung, J Laryngol Otol 2002). The ear irrigation procedure involved immediately draining the ear after the vinegar was instilled with a syringe, and then drying the ear with a hair dryer for one minute. The authors of this study warned that any diluted vinegar which remains in the ear can irritate the ear canal and cause severe erosion. Acetic acid can also damage the delicate hair cells of the inner ear (sensory cells which play a role in hearing and balance) (Dohar, Pediatr Infect Dis J 2003). In addition to its common liquid form, apple cider vinegar is sold as a supplement as capsules or tablets. However, there are no clinical studies on the effects of these pills on blood sugar or weight loss in people. 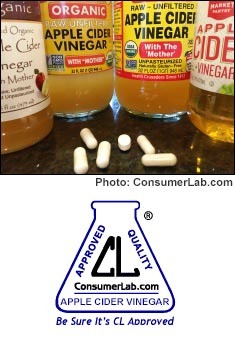 Apple Cider Vinegar Review -- Bottled Liquids and Pills !